Fudge has to be one of may favorite things to make , not only because its so cool to watch it all come together like a science experiment & check if it has reached the soft ball stage but because its tastes so dam fine ! I have never meet anyone that doesn't like this fudge. If you grew up in New Zealand it was thing that childhood sweet dreams were made of, always at birthday parties and if you were good you got to lick the beaters and scrape the pot ! I am not usually one to boast but I reckon I make the best Russian Fudge but Russian fudge is well not entirely Russian, its a pretty uniquely kiwi thing and the name for this fudge, which from a search round on the net seems to come from a Polish recipe which is very similar to our recipe - Its fudge but not as you know it. I love the fact that its creamy , smooth , crumbly and not overly sweet . So perfect cut into chunks and wrapped up with a ribbon , it will always leave people wanting more ! This comes from Chelsea Sugars website and is a Jo Segar Recipe, enjoy. Place all ingredients except the vanilla, into a large saucepan. Bring to a gentle boil and cook for around 10 mins , starring gently to avoid it catching . You will start to see the color changing to a rich caramel & it thickening up. Beat with an electric beater till very thick and no longer glossy , the longer you can beat it the better , I keep mine going till its really really thick . Pour into a lightly greased 20cm glass dish . Cut pieces when soft & leave till cold to break up . Caution : very addictive ! 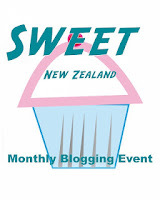 This post is part of Sweet New Zealand with thanks to my darling lemon thyme for hosting this months event ! Ps- check out my darling lemon thyme for the most delicious gluten free / vegan / amazing eats ! Thanks Emma , and its gluten free ! Welcome to Sweet New Zealand, I hope that you had fun and met other Kiwi bloggers (well, I am Italian, but also Kiwi, so I guess that counts :-)).